If you don’t care about baseband upgrade, the current latest version of Redsn0w 0.9.6 can also jailbreak iOS 4.3.2 for both Windows and Mac users on iPhone 4, 3GS, iPad, and iPod touch 4G/3G. But just like the PwnageTool jailbreak, Redsn0w 0.9.6 too is limited to tethered boot only, which means that you will have to boot your iOS device in tethered state on every reboot. a) First you need to download the orignal firmware files. For this jailbreak, you need to download both iOS 4.3.2 and iOS 4.3.1. Look for the download links at the end of this post. b) Before proceeding, you need to restore your iOS device to iOS 4.3.2. Do this with iTunes 10.2.1 (download link at the end of this post) and use the .ipsw firmware file that you downloaded in Step a.
c) Download Redsn0w 0.9.6 (see the download link at the end of this post). 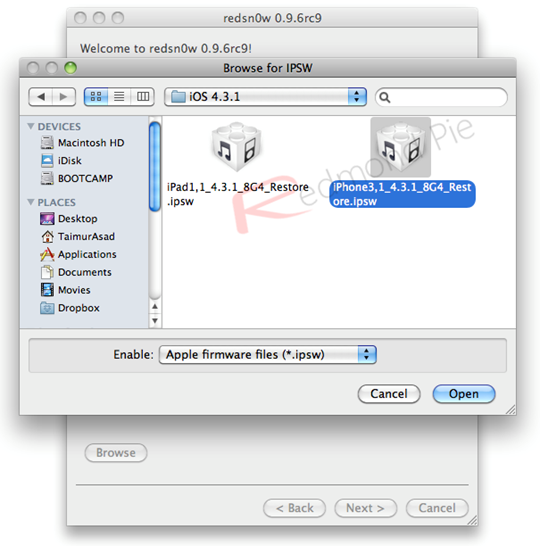 Run Redsn0w and browse for the official iOS 4.3.1 firmware when asked. Remember! point it to iOS 4.3.1 not iOS 4.3.2. See the screenshot below for the reference. d) When the IPSW is identified, click Next. A screen saying “Please select your options” will appear. Make sure the “Install Cydia” option is check. Click “Next >”. e) Turn off your device and make sure it is connected to your PC. Click “Next >”. 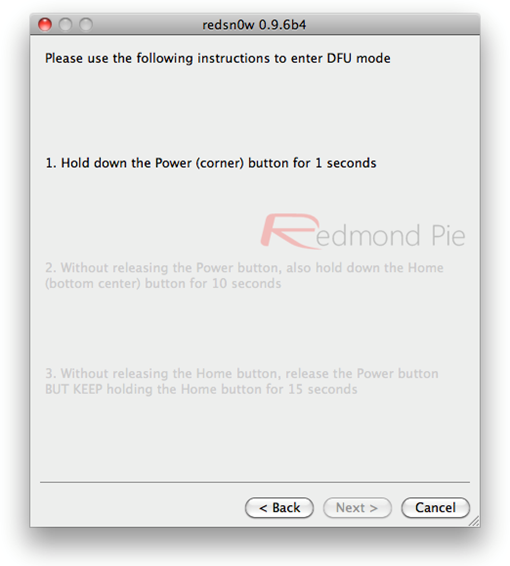 At this stage you will be presented with a screen where you will be guided on how to enter DFU mode. Follow the on screen instructions. f) When your iOS device enters DFU mode successfully. Redsn0w will restore your iOS device with custom firmware. 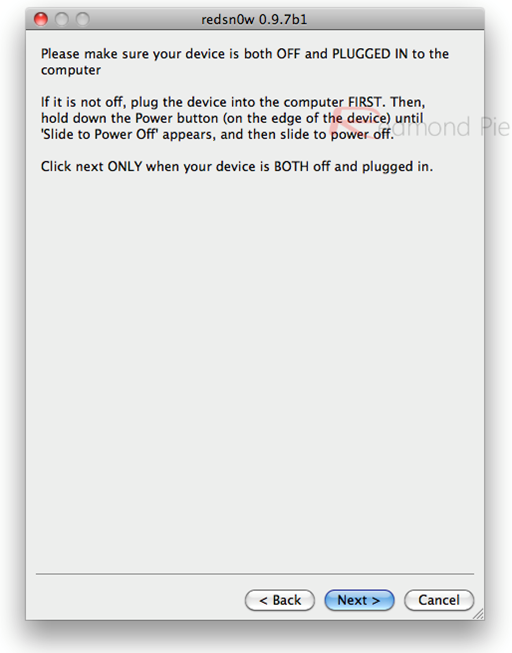 When done, your iOS device will reboot to iOS 4.3.2 firmware. g) This jailbreak is tethered so whenever you reboot your iOS device to a jailbroken state, just selected “Just boot tethered right now” next time when you run RedSn0w.